The Scoop: No matter where people fall on the political spectrum, the constant barrage of the 24-hour news cycle can become exhausting. The Capitol Steps, a political comedy troupe based in Washington D.C., believes that, if you don’t laugh about politics, you might end up crying. That’s why the nearly 40-year-old satirical troupe translates today’s political headlines into chuckles for its audiences. 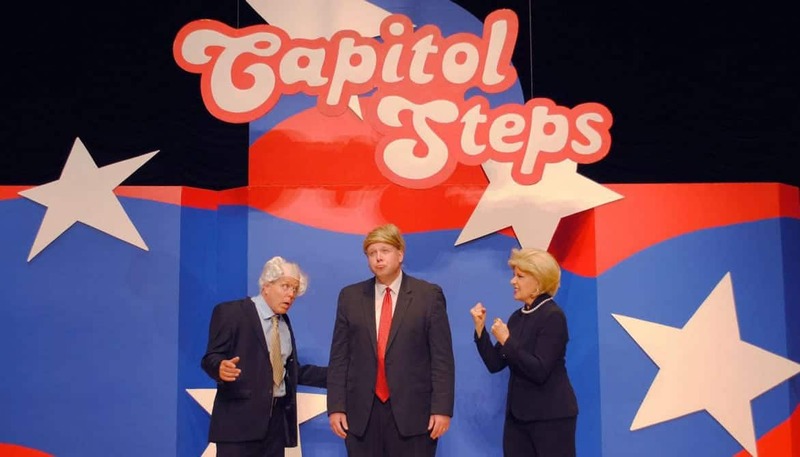 With sketches and musical numbers including “How Do You Solve a Problem Like Korea?” and “Battle Hymn of the Tea Public,” The Capitol Steps will have you and your date rolling with laughter — perhaps even across the aisle. Members of The Capitol Steps don’t always know what the big story around the country will be in a month — or even a week. But the satirical comedy troupe is always looking for new material because — like politicians themselves — they don’t want their topical live comedy sketches and musical numbers to become yesterday’s news. Capitol Steps member and Manager Mark Eaton said the comedy troupe takes on today’s biggest political stories. The troupe has to be careful when crafting comedy because, unlike “Saturday Night Live,” which airs weekly, The Capitol Steps’ material has to last long enough for several shows spread out over a few weeks. For example, Mark said he wouldn’t write anything about the government shutdown of late 2018 and early 2019 because it could soon be out of the news cycle. The Capitol Steps are careful about the material they include in their shows because they want to ensure audiences understand the jokes. Nobody wants to have to remember obscure news stories from months ago to enjoy comedy on a date night. The group takes extra care not to become too enmeshed in the political world of Washington, D.C. — where the troupe is based. That’s why The Capitol Steps has become a sought-after ticket for daters on both sides of the political aisle to come together and laugh at the absurdity of our politicians — at least for a couple of hours. For an out-of-the-ordinary date night, The Capitol Steps always has a healthy dose of humor. The group performs every Friday and Saturday night at the Ronald Reagan Building in Washington, D.C., but if you live elsewhere in the United States, the odds are that the troupe will make an appearance near you in the future. And Mark means anywhere. In early 2019, The Capitol Steps will appear in Long Beach, California; Skokie, Illinois; and West Palm Beach, Florida, to name a few locations. The Capitol Steps can perform in so many places because the 25-member troupe breaks off into five-person groups to tour the country. So, if one troupe is in D.C. for a Friday evening performance, another could be in California on the same evening. Daters can also make an evening out of listening to the group’s routines at home. Every six months, The Capitol Steps perform a biannual holiday special that airs on NPR, once on New Year’s Eve and the other on the Fourth of July. “A lot of what we do on the NPR specials is a year in review,” Mark said. Like Mark, most of the members of Capitol Steps have been involved in D.C. politics themselves. That insider knowledge helps these comedians understand what’s going on — and makes them more interested in poking fun at it. The Capitol Steps focuses exclusively on political content, which means they’re always refreshing the show. Even something that was big news a year ago wouldn’t make today’s audiences laugh. That’s why many fans come back to see The Capitol Steps’ new material and why the group is regularly invited back to venues it has performed in fairly recently. The Capitol Steps constantly updates its show to provide laughs for discerning audiences around the U.S. The model works, as the troupe has only expanded since the first Capitol Steps group was formed in 1981. Most of the members can’t believe their luck to be earning a living as full-time comedians. Many never expected to become professional entertainers. 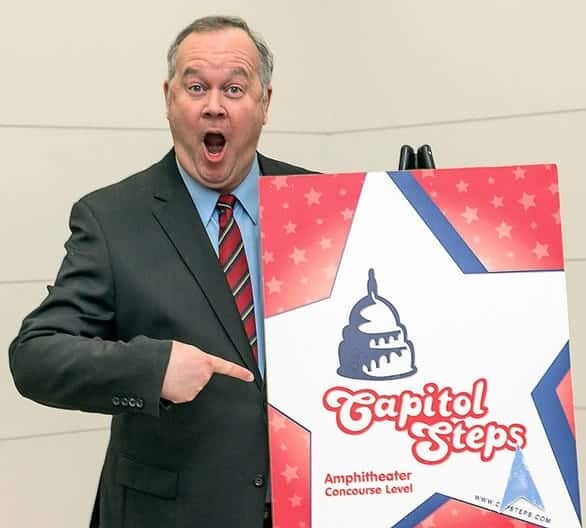 With plans for hundreds of shows in 2019 and 2020, The Capitol Steps is more popular than ever. And audiences can’t seem to get enough of the troupe’s take on political satire. “Politicians are very powerful people, but the one thing they can’t stop is being mocked. It’s healthy,” Mark said. While political satire may seem like a heavy subject for an early date night, Mark suggests that an evening at The Capitol Steps can provide revealing information about a potential partner. As politics become increasingly divisive, fewer daters are willing to be with someone who doesn’t share their political leanings. So, a date night at the show can demonstrate if you and your date could even handle being together. The Capitol Steps doesn’t poke fun at one political group at the expense of the other, either, finding fodder from both parties. But one thing that all sides of the political spectrum could probably agree on is that they’re tired of always hearing about politics. Be it social media or the news, Americans are often overwhelmed with information, news stories, and political rants. The Capitol Steps know their material is funny, but they don’t think their shows are just empty entertainment.